^ Giuseppe Alberigo, Jean XXIII devant l'histoire, Seuil, 1989, p204, notes 17, 18. 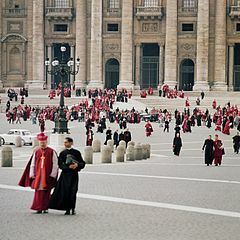 ^ Documentation Catholique, 1346, 267 sq. Documentation Catholique, 1367, 67 sq. ^ Acta et documenta de concilio Vaticano II apparando; Polygl. Vat. series II (praeparatoira), vol. II, pars III, 384 385. ^ ウィルトゲン神父は75の草案が成立していたという。"After two year' work, ending on the eve of the council with the dissolution of most of these bodies, a total of seventy-five schemas had been prepared. ... the seventy-five schemas were ultimately reduced to twenty. ... It was certain, however, that no other council had had a preparation "so vast, so diligently carried out, and so profound."" Rev. Ralph Wiltgen, SVD Rhine Flows into the Tiber, 1985, TAN Books, p22. ^ ヨハネ23世は、レジェ、フリンクス、アルフリンク、スーネンス、ケーニヒ、リエナールが共同署名した嘆願書を受け取っていた。嘆願書は、公会議が誤謬を断罪しないことを要求していた。 G Routhier, "Le Cardinal Léger et la préparation de Vatican II", in Revue d'Histoire de l'Eglise de France, no. 205 (1994): 301. 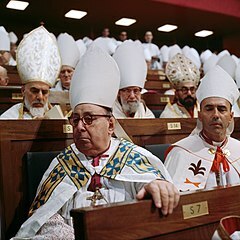 ^ ウィルトゲン神父はミサを含めて50分だったという。The first business meeting, including Mass, had lasted only fifty minutes. Rev. Ralph Wiltgen, SVD Rhine Flows into the Tiber, 1985, TAN Books, p 17. ^ ティスラン枢機卿は、後に、ジャン・ギトンに、公会議が開かれる前に自分を含めて進歩派の枢機卿たちが集まって、ヨハネ23世によって作られた規則を拒否し、第一回総会を乗っ取ることを決めていたことを打ち明けている。Jean Guitton, Paul VI secret, p123. in Romano Amerio, "Iota Unum" (NEL, 1987), p80. ^ Rev. Ralph Wiltgen, SVD Rhine Flows into the Tiber, 1985, TAN Books, p 17. 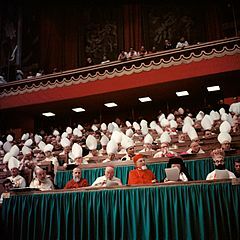 ^ After this election, it was not too hard to foresee which group was well enough organized to take over leadership at the Second Vatican Council. The Rhine had begun to flow into the Tiber. Rev. Ralph Wiltgen, SVD Rhine Flows into the Tiber, 1985, TAN Books, p 19. ^ Rev. Ralph Wiltgen, SVD Rhine Flows into the Tiber, 1985, TAN Books, p 59. ^ 公会議解説叢書6『歴史に輝く教会』南山大学監修1969年中央出版社 299ページ。Rev. Ralph Wiltgen, SVD Rhine Flows into the Tiber, 1985, TAN Books, p 146. ^ Rev. Ralph Wiltgen, SVD Rhine Flows into the Tiber, 1985, TAN Books, p 177. ^ Rev. Ralph Wiltgen, SVD Rhine Flows into the Tiber, 1985, TAN Books, p 251.